I'll mention that by 1986 Robin Smith wasn't art editor, I think that position was eliminated with budget cuts in '85? This is just me making up things about how comics work, but I'd bet they had him draw a couple different covers they were able to reuse here, that seems very in-line with MacManus's policies about building backlogs. 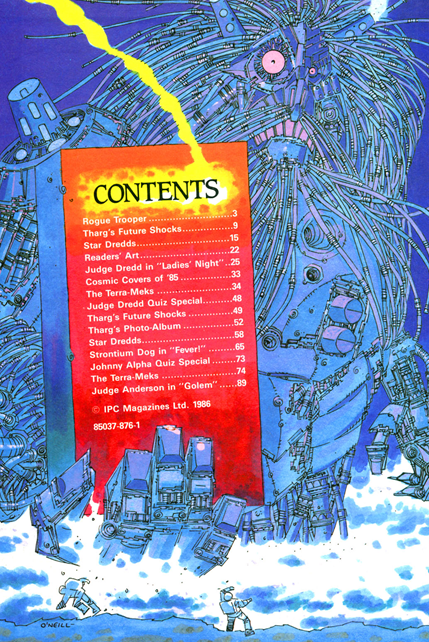 Similarly I wonder if the table of contents page wasn't from some other work and repurposed for the annual, or was a piece submitted for one of the previous annual table of contents (O'Neill also did that page for the 85 annual, with Torquemada). You couldn't really use this one for the cover, because it's just a cool giant cyber dude. And yeah, from what I've read the annuals were always big money makers no matter the quality, so the feeling by management was to make them as cheaply as possible to maximize profit. MacManus talks about fighting to get as much money as possible for the first Dredd annual. Should have made myelf clearer - if you are paying Kev O'Neill to do a colour picture, ask him to do the cover instead with Dredd et al - neither image is super detailed so while you might have had to pay him a bit more, it would have been an improvement on that lack lustre cover - it actually looks like a rough/composite of other drawings. I might also have a bit of a downer on this annual for lacking a killer story - 1986 had the wonderful "Beast of Milton Keynes", while 88 gets "She-Devils", "Complaint" AND "Torquemada's Second Honeymoon"! The Dredd annual is also the weakest this year, with the McCarthy Dredd doing all the heavy lifting - next year we get one of my favourite annual stories with "Last of the Bad Guys". Seems a shame that they have this blip with the annuals when the Prog is otherwise on fire,,, Maybe Dice Man is a drain on the talent, in the smaller way than we will see when Crisis and the Megazine come along and put pressure on an already leaky talent pool! Is that O'Neill robot dude in fact the Alan Moore droid showing Tharg the red card? The end is here! 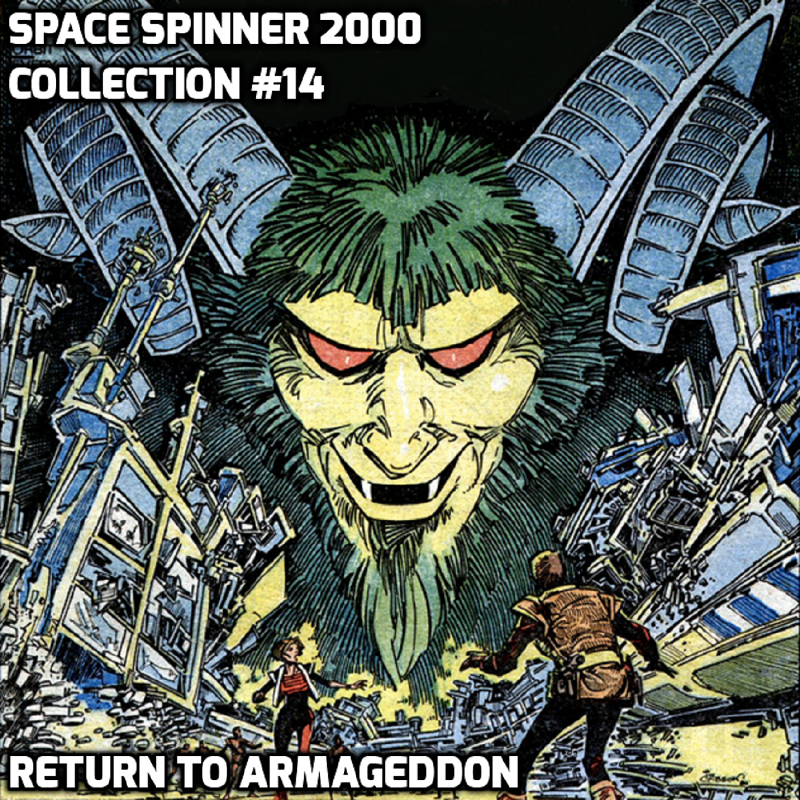 It’s the fourteenth in our series of Space Spinner 2000 collections! These collections have all of our coverage for a specific character or storyline, all in one place. They’re a great accompaniment to reading collected versions of 2000AD, or to just hear your favorite thrill all in one place. We’ve all found ourselves in fairly generic sci-fi settings, exploring new life and new civilizations and all that. But what happens if instead of finding more dudes with weird ears and foreheads you found a planet covered in ice, with dead people and literal demons frozen in the glaciers? What if your story about the machinations of space pirates suddenly runs afoul of zombies and demonic babies? What if your story about being the handsome chosen one in a battle of galactic fate gets sidetracked, and instead you find yourself irreparable scarred and wishing for a death that cannot come, your only compassion an anti-social robot that is actually pretty cool with helping other robots kill all humans? All this and more make Return to Armageddon an amazing story! It’s certainly a minor early 2000AD thrill, but if you listen tour giddiness about it, I think you’ll see why it’s a Space Spinner classic! Looking forward to listening to that one tonight! Any also worth saying the intro with Alexa voice lady was absolute genius! My first regular prog cover there, so as you can guess, I am with Colin on this one - beautiful art (quite literally beautiful - does anyone draw women better than Redondo?) and I started during the mushy peas Amtrak phase. The worst thing by far about the end is that it wraps it all up - RTA could have been Tharg's answer to Flash Gordon, the thrill injected, fucked up version of those space romps. Let them play again! In our action-packed eighth episode Conrad continues the journey through the pages of the infamous classic UK comic with issues 22-24 of Action! This time Hell’s Highway blow up, Blackjack sings, Lefty gets detention, and Dredger gets into helicopter antics! I know I've been slacking on getting new episodes out recently, but that should be coming to an end! Next week we'll have two collection episodes, for Portrait of a Mutant and the first half of Nemesis the Warlock Book 1 (Which will cover Terror Tube through Book 2). Then the week after that Fox and I will return to regular podcasting, and the prog-slog shall continue! No Surrender! 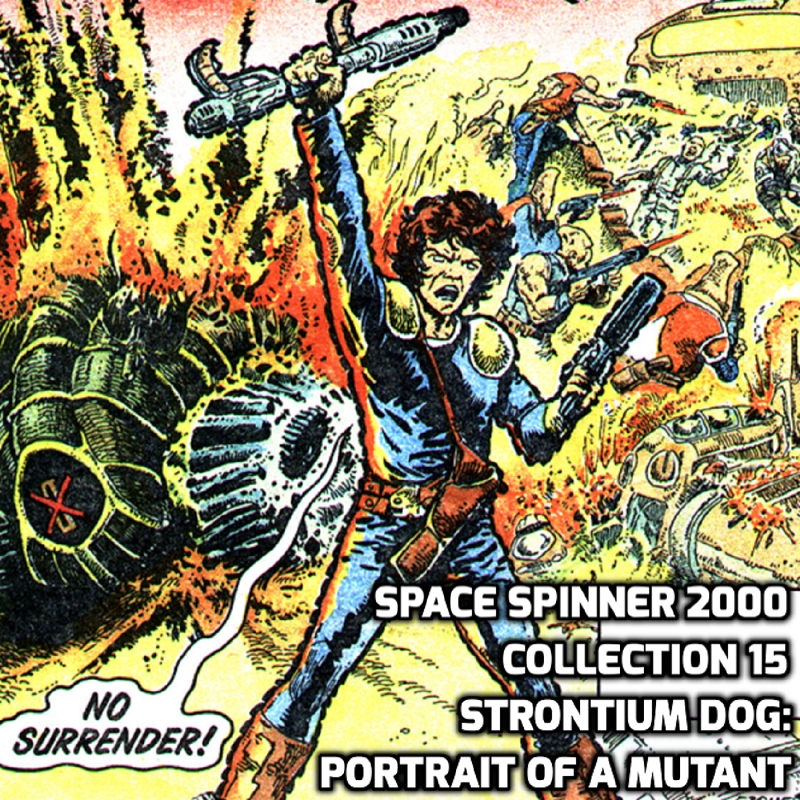 It’s the fifteenth in our series of Space Spinner 2000 collections! These collections have all of our coverage for a specific character or storyline, all in one place. They’re a great accompaniment to reading collected versions of 2000AD, or to just hear your favorite thrill all in one place. We last talked about Strontium Dog in our 9th collection, when we covered the Journey to hell storyline. We’re now 81 progs in the future and Johnny and Wulf have been working steadily. They’ve time traveled to collect a bounty on Hitler, won millions for Milton Keynes in space poker, and fought evil man-eating space baboon Bad Bob. Now it’s finally time to learn more about Britain’s future and Johnny Alpha’s past in the classic story Portrait of a Mutant! It’s one of the most important Strontium Dog stories, and possibly all of 2000AD! They’ve time traveled to collect a bounty on Hitler, won millions for Milton Keynes in space poker, and fought evil man-eating space baboon Bad Bob. Oh jeez! I think it’s actually Bad Boab? Bubo and his bad boys! Thanks Conrad. I am really enjoying the Action coverage and even though I have never read a single strip from it, I still find the coverage and comments fun and interesting. I do not remember how I first read this strip, it was possibly in the Best Of 2000AD monthly, but I read it after I had read Outlaw. It was a huge thrill and explained so much stuff in really great way. You mentioned it in the podcast but the bit that really stamps it as a superb piece of work for me is the bit at the end where the Kreelers become a new police force in two similar panels. It is a small and subtle thing but it really adds the cherry to the cake in terms of making a good ending great. Oh man I love 'Portrait of a Mutant', the story you're about to cover 'Rage' is possibly my absolute favourite but this is soooo close. Its real strength is when you compare it to something like 'Solo' in terms of how it introduces concepts and ideas as part of a single origin story. They both do similar things, cover a lot of ground to fill out the blanks we have about their lead character, even as far as weaponary, motivation and building their world. The difference is where 'Solo' feels forced and heavy handed in doing this, cramming in so much none of it sits well in the story itself, in 'Portrait' it all sits so naturally. the story doesn't feel like a vehicle for the reveals, rather the reveals feels like they fit naturally in the story that is the driving force behind the what we see. Nothing feels forced or corny the story is so well crafted that it takes a look back to see quite how much we know about the world of Johnny Alpha and co it fills out and sets up. If you'd never read any of the previous stuff it wouldn't matter a jot its a bloody thrilling story first and an origin second. Loved this 'collected edition' and thanks for putting it together.